I remember some pretty exhausted seasons of parenting. It used to feel like my children were taking shifts. One would challenge us in a particular way, and then, about the time it felt like we were figuring out what to do with that situation, the next child would punch in with a completely different problem. Sometimes their “shifts” were each only a few minutes long and the problems were resolved fairly quickly. Other times a bigger, more perplexing issue would continue for several weeks or even months, looming over us while the little challenges still continued to arise on a daily, hourly, and moment-by-moment basis. On top of those child-related challenges, I was getting acquainted and reacquainted over and over with the different versions of me that came with pregnancy, postpartum, and in-between-pregnancies hormones. You probably know what I’m talking about. I can remember hiding in the bathroom, tears flowing, begging God for wisdom – and for the strength and patience and courage to open the door and go back out to face my precious children again. But I felt so inadequate and unqualified for the job God had given me. And just plain exhausted. I look back now and can see that God used those days of helplessness to change me – and to prepare me for the future challenges He had (and still has) in store for me. Over time, as I struggled with the demands of motherhood, I became much more aware of my sin and my utter dependence on God. It’s no coincidence that, at the same time, I became much more aware of and grateful for the inexplicable grace of God. He was there – all-powerful, all-wise, always-faithful, and ever-loving – whenever I was humble enough to turn to Him. It took awhile for God to get through to me, in my “I-grew-up-in-a-Christian-home-I-should-be-able-to-handle-this” arrogance. 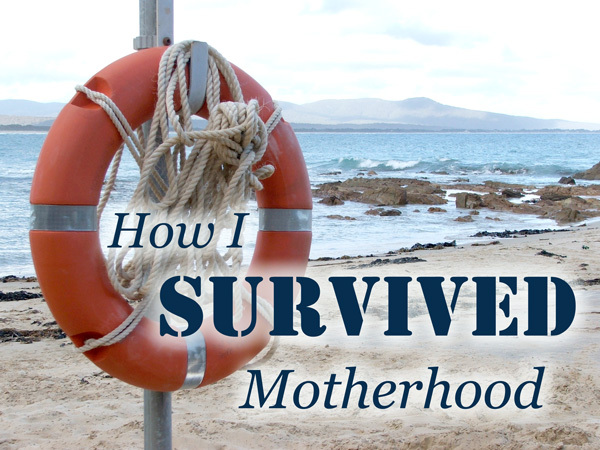 But as I think back over those oh-so-challenging first years of motherhood, I can see at least three gifts from God that contributed to my survival. I became desperate enough to finally look to God for answers. It’s true, when James says,“If any of you lacks wisdom, let him ask God, who gives generously to all without reproach, and it will be given him.” Over and over, God gave wisdom when I asked for it. I started asking Him to change my heart as I confessed sinful attitudes and actions. I asked Him to change the hearts of our children instead of trying to do it myself. God is the one doing the work in their lives. They gave us counsel. Some of our toughest parenting years were during a period of time when we were in between churches, without the support and encouragement of our fellow believers. Then God graciously planted us into a body of believers who had a powerful influence on our children’s lives. They prayed for us. “The effective fervent prayer of a righteous man avails much” (James 5:16b). They helped in practical, loving ways when I was too tired to do it alone. It’s amazing what the body of Christ can do. God used our challenges to drive me back into His Word, after becoming distracted and “too busy” during our family’s early years. As I read, God changed me. God’s Word became the standard of right and wrong that we could point to every time we disciplined the children. As we read, they changed, too. As they left home, they took that standard along with them. God graciously walked with me through those challenging years of motherhood — encouraging me to come boldly before the throne of grace to find help in time of need, loving me through the loving deeds and words of His children, and speaking to me through His Word. I give thanks, knowing that He will continue to display His perfect grace through my weakness, and that He will continue to walk with me in this new and sometimes-quieter season of motherhood, still blessing me with the privilege of prayer, fellowship and His Word. I read this at a time in my life when I need it the most. I have hardened my heart toward my 13 year old and my 8 year old. I have 6 kids from ages 13 to 5 months. Thank you for your reminder that I need to run to God for help. Thank you so much for the encouragement! I had a rough day yesterday with my little ones and this was a wonderful e-mail to read first thing this morning. Thank you. I was just looking at your catalog this morning and seeing the picture of your family in it thinking, “How did she do it?” Now I know, you struggled just like I do every day and that God’s spirit working in me is the only way I can be the mother I need to be. I have come to the place like you did, where I see my need for prayer, because I can’t do this on my own. Very encouraging. I appreciate your honesty that parenting a big family is tough! I too have 6 children (12 and under). It can be hard to relate with parents of older children and smaller families but you always seem to express the truth of raising a big brood. Thanks for your encouragement! It means a lot to me in these joyful but exhausting years of little ones. Thank you for your encouragement and for sharing the wisdom that our gracious Heavenly Father imparted to you as you sought His strength and help in the trenches of motherhood. In His great wisdom, He has so designed motherhood to be every bit of a sanctification process for us as we disciple the precious souls He entrusts to our care and the journey is one of daily surrender and dependence on Him for both ourselves and our children. God really loves us so much to do this. In the end we really come to the great truth that all things do work together for our good and His glory for all those called according to His purpose and good will and it is in our utter weakness that He receives all the Glory as we cast ourselves and cares upon the One who can do all things and in dependence upon Him , who is all we need to accomplish all He has asked us to do. His power is perfected in our weakness. All praise and glory be to Him. Thanks for this encouragement, Pam! It’s much needed 🙂 Praying for you and your prep for our next study in March! This is a beautiful summation – I’m sure He’s graciously taught you much more! – and a breath of fresh air in my household this day. Thank you for sharing. The Lord has raised up a powerful Godly example in you and your “arrows” are going much farther than you know. To Him be the Glory! Thank you for this it is exactly where God has me right now. Sitting at the throne of grace. Thank you for being so open and honest in your walk, it is such an encouragement.